New York (N. Y.) 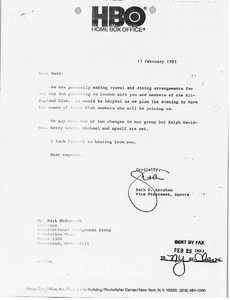 - Abraham writes regarding the arrangements for the London gathering with the All England Club. 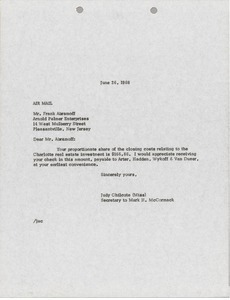 North Carolina - McCormack's secretary informing Abramoff of his share of the closing costs for an unidentified Charlotte real estate transaction. Requests payment be made to Arter, Hadden, Wykoff & Van Duzer. 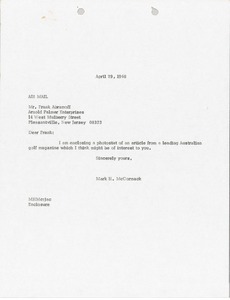 Letter from Mark H. McCormack's secretary, Nancy Grey, regarding the Pleasantville Division opening mail addressed to McCormack. 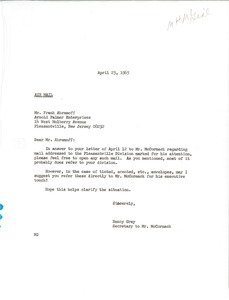 Requesting Abramoff respond to an unidentified letter. Enclosure not present. 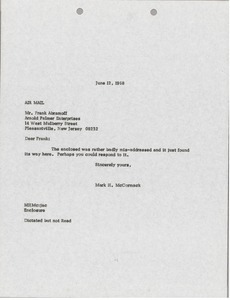 Pleasantville (N.J.) - Letter regarding an unopened letter addressed to McCormack which was sent to the Pleasantville Division and how to handle such letters in the future. 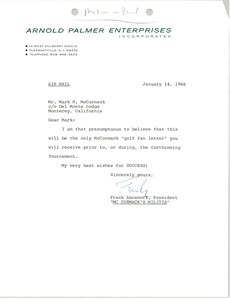 Pleasantville (N.J.) - Letter wishing McCormack luck during the upcoming golf tournament. 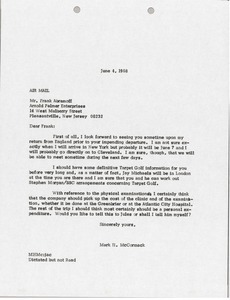 Suggesting that Abramoff meet Jay Michaels while they are both in London in order to talk about Target Golf. McCormack also suggests that the company cover the cost of physical examinations and clinics and requests the information be forwarded to Jules Rosenthal. 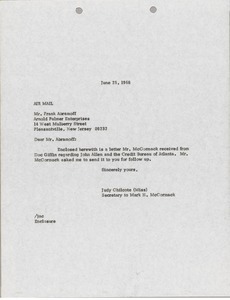 McCormack's secretary forwarding a letter from Doc Griffin to McCormack regarding John Allen. 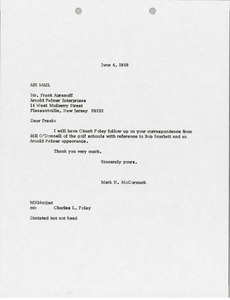 McCormack requests that Abramoff follow up on it. Enclosures not with letter. 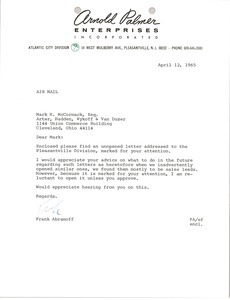 Informing Abramoff that Chuck Foley will be in touch regarding Bill O'Donnell of golf schools, Bob Scarlett and an Arnold Palmer appearance.